I visited the new & improved SOHO Clothiers in Rogers to pick up a few transitional pieces just in time to look chic for Spring. 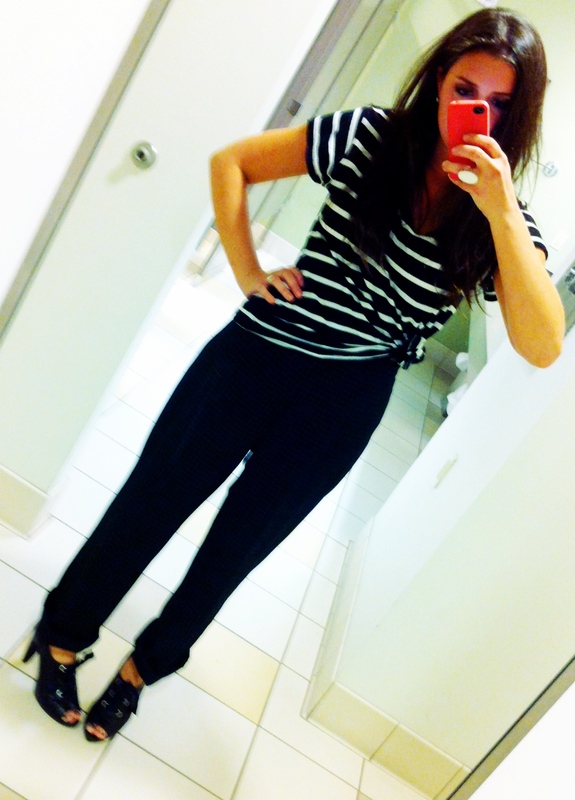 I chose the slouchy black & cream pant for it’s supreme versatility. 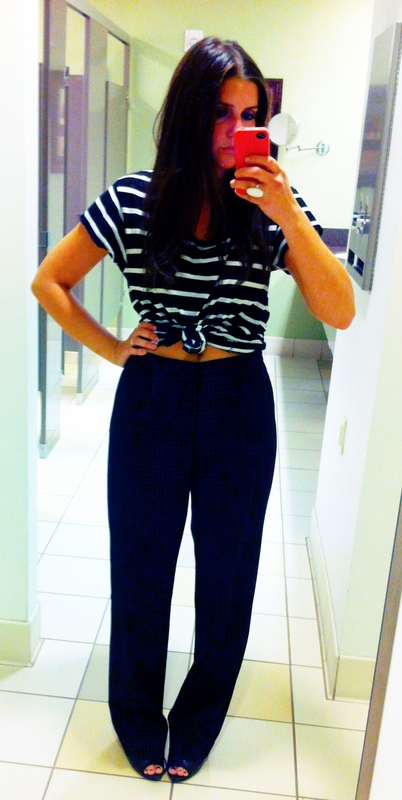 Comfortable but still dressy, the trouser can be paired with virtually anything. 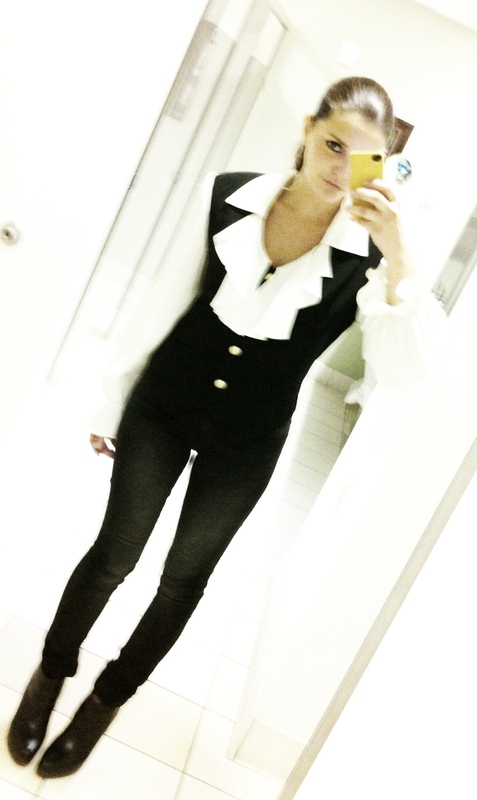 I was immediately drawn to the BB Dakota embellished blazer. The sequins picked up whatever color they were near, making it a wear-with-everything staple. 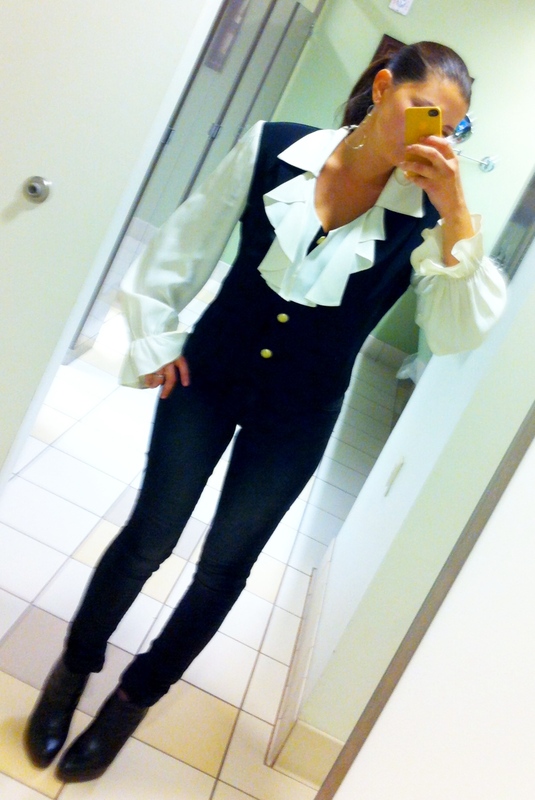 It also had a trim fit which gives it a continuity with the outfit rather than feeling like an add-on. Leslie Claud Freeman and her family finalized the purchase of the Rogers shopping staple, Soho Clothiers on April 20th, 2013. After almost a year on the ownership side of retail, she’s as enthusiastic as ever. She speaks about SOHO with an air of gratitude, excited to see the store continue to grow, while still satisfying the existing customer base. She hopes current and new shoppers will come see the “updated” shop. Shoppers have actually been her priority long before she bought the store. Leslie was an apparel studies major at the U of A and spent several years in the fashion industry – first at Mason’s, then at BCBG. Even in high school (yes, I remember!) she always dressed to impress and had the best hair. When dressing herself, Leslie loves to be feminine but also comfortable. She likes an outfit (like a maxi dress) that takes her from low-key to dressy by the switch of a shoe or the addition of a blazer. But she admits, “nothing can beat a good pair of jeans”. Like most of us, Leslie is ready for spring. Drawing inspiration from magazines and stylish people everywhere, she’s stocked SOHO with color and prints. She’s especially looking forward to helping her customers find those transitional pieces (like the Ella Moss pant or the BB Dakota blazer I chose) to refresh their wardrobe. See the latest from SOHO on facebook & instagram. A very sweet gal named Darcy started a website called Hello Luvvy. She was kind enough to take some photos of me and interview me for her adorable site. Here’s an excerpt from her post. For the whole thing, go —> here. The location for this shoot was the Fayetteville Country Club. If you have followed any of my Normal Girl posts, you probably understand that I generally just love fashion blogs. Even though “The Window Shopper” doesn’t define herself as a fashion blogger (she is much more! ), she is inspiring many with her style, so I want to introduce you ladies to Payton (The Window Shopper). I started following Payton on instagram a few months ago and I immediately began to love her style. She is an absolute committed fashionista. What I mean by this, is that she simply loves fashion, however individually defined. Payton is an example of how fashion should be; all personal, all fun, and all inspiring. I asked her to do a photo shoot and interview with HelloLuvvy because I believe she defines what the purpose of our Fashion section should be. It should be about expression and fun and rocking any look you love with confidence. Payton exemplifies the girl’s dream of wearing exactly what they want and when they want, and wearing it with that confident edge. Payton has been featured in Citiscapes mag, has modeled for some of NWA’s favorite boutiques, and has recently embarked on an exciting new career in fashion with Btiques. Below is a photo shoot we collaborated on and a few interview questions to pick Payton’s fashion loving brain. The details for the clothing in this shoot are basically as follows: thrifted. Pretty awesome! Payton informs me that she goes thrifting two, sometimes three times a week, and she always hits the dress racks. Her jewels are vintage from Mae’s Emporium and the shoes are from Target. I am pretty sure you love her even more now! I had a great time hanging with this girl for a few hours snapping some photos and just talking about fashion and life. She is truly committed and confident. I learned a lot from her and I hope you luvvies do too. Below is her professional Bio and links to her blog and instagram. I highly recommend following her in some capacity and downloading the Btiques App for your iPhone. Payton Rosenzweig Bridewell is a native of Fayetteville. After graduating from Tulane University in New Orleans, she spent five years working for Procter & Gamble on the CoverGirl and Olay brands. Payton has always been a fashion-enthusiast (find her on the blog, thewindowshopper.org or see her work for NWAFWstyling and modeling in publicity photoshoots for local stores) and is practically a fixture in local magazine, Citiscapes. Payton recently left the corporate world to join the Ark Challenge-winning shopping application, Btiques. 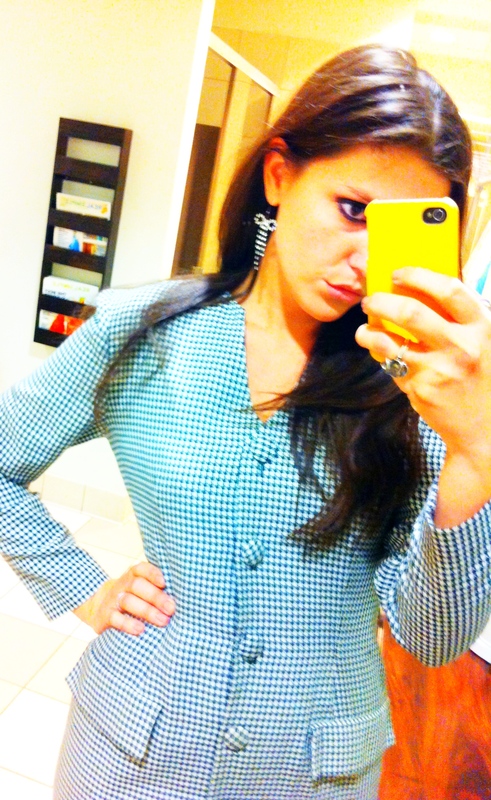 Btiques is a free service that allows iPhone/iPad users to shop local boutiques directly from their phones. The app changes the shopping game; it allows users to find, follow and shop the newest boutique looks on the go! Payton jumped at the chance to join the startup and is working with co-creators Sara Beck and Will Carter to introduce the app to the fashion-forward of NWA, Arkansas and beyond. So if you watch Seinfeld, you will definitely remember the episode that Jerry is coerced into wearing the puffy shirt on The Today Show. I’m a Seinfeld fan (like most of us) and this shirt totally reminded me of that one. But slightly chicer. 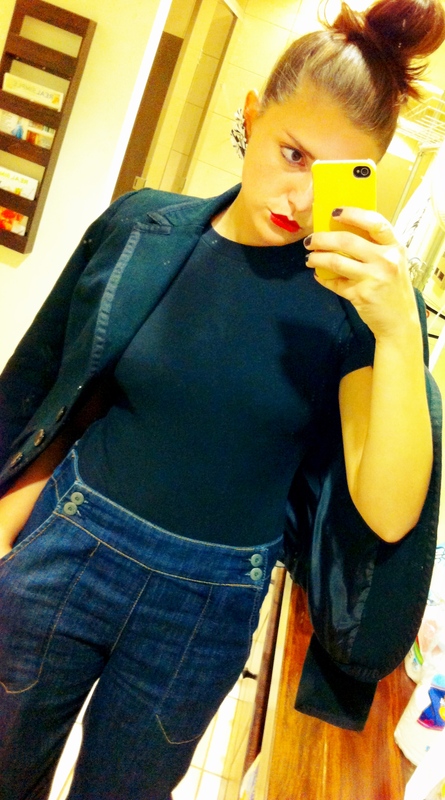 Sometimes I feel like jeans/black top/red lip – DONE. I really liked the juxtaposition of stripes on the shirt with checkers on the pants but I couldn’t figure out what to do with the shirt because the pants are a little big. I tried tucked in, tied to the side, tied in front and finally settled on tied in the back. Then I rolled the pants. The most comfortable outfit ever. I found this plus-size t-shirt at the thrift store and it’s just long enough to be a dress (if you take precautions! ).